What kind of refrigeration is best for a restaurant? An integral part of any restaurant is its refrigeration systems. Restaurant refrigeration ranges from small coolers like a dorm fridge to massive walk-in refrigerators and freezers and everything in between. Carefully selecting the right type of refrigeration for a new restaurant will ensure that your commercial kitchen runs smoothly and it will contribute to a positive experience for staff and customers. One of the biggest steps in opening a restaurant is buying the right kind of commercial kitchen equipment. Determine what types of coolers and freezers you need before you buy anything. Your restaurant concept and its size will be the biggest factors in what you buy for restaurant refrigeration. A large walk-in refrigerator probably won’t work if you have limited space, but you'll need ample freezer space if your menu is based on a lot of frozen pub grub foods like fries, chicken wings, and onion rings. Your food distributors' delivery schedule will also affect what you need for restaurant refrigeration. Restaurants that receive daily deliveries of fresh meats, seafood, and produce won’t need as much in the way of refrigeration as restaurants that only get a delivery once or twice a week. Reach-in coolers are usually found in the kitchen and bar areas of a restaurant although they can be located in the wait station as well. A reach-in is low to the ground. It has two or three doors and staff must reach in to find items. These coolers work best when they're isolated from the cooking line and all that heat. They'll help keep the food stored inside at safe holding temperatures. Often referred to as fish drawers, under-counter refrigeration drawers are ideal for small restaurant kitchens. They're designed to be installed directly into a cooking line and can hold seafood, poultry, or meat for the grill or sauté stations. Walk-in coolers can be the size of a small closet or as big as a living room. Walk-ins are good for holding large boxes of produce, buckets of food, blocks of cheese, and anything else that's large, bulky and perishable. Food-grade shelves, wall covering, and flooring must be used in walk-ins. Check with your local health department for your state’s health codes pertaining to these restaurant coolers. Like coolers, restaurant freezers can be either reach-ins or walk-ins. Keep in mind that a restaurant freezer is not a place to store or make ice. Invest in an ice machine for that job. You can purchase ice machines new or used or you can lease them. Coolers for the bar are known as either low boys because they're low to the ground or as high boys when they stand to waist level. White and blush wines, bottled beer, bar mixes, and any other bottled or canned beverages are stored in bar coolers. A separate walk-in refrigerator might be necessary for beer kegs, or you can keep them in your restaurant kitchen walk-in if space permits. 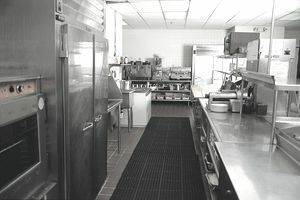 There are many types of restaurant refrigeration available. It's important to select the right kind of cooler or freezer to best fit your commercial kitchen or bar area. And there's no harm in purchasing gently-used commercial refrigeration. It will save you a great deal of start-up capital.